You never know when you would need a virtual Wifi router. Luckily your PC has the ability to turn into a virtual Wifi router. 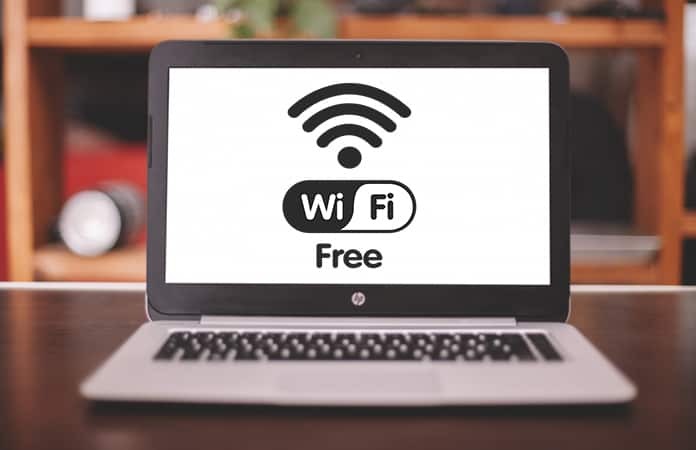 You just need to install a WiFi Hotspot software for Windows and you will easily create a Hotspot with your Laptop or PC. Check out below and find the best Wifi Hotspot Software for Windows. Though, they are free but some of the Hotspot Software requires you to subscribe to a paid version to unlock all the features. This is one of the famous Wifi Hotspot Software for Windows. However, this software is free but you need buy any one of the two versions to get extra functions. The two versions are Pro and Max. So the main distinguish feature between the paid and unpaid version is that the free version uses Ethernet and Wifi to establish a Hotspot. Whereas, the paid version let you use the cellular data. Other paid features offered by Connectify Hotspot are Real-time monitoring of the network usage and ad-block service. Moreover, with a paid version, you can enter a custom SSID, firewall, bridging mode and more. 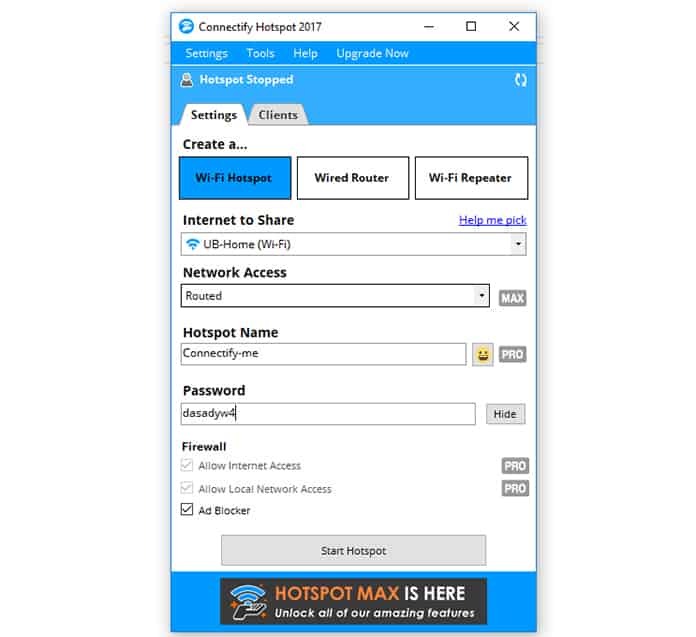 This is a free Wifi Hotspot software for Windows, which has more free features than the mentioned paid Hotspot software. It is compatible with all kind of internet connection albeit be Wifi, Ethernet or cellular data. The software has a WPA 2 password Encryption, to offer a secure and private connection. Though it is compatible with Windows 7, 8 and 8.1, it does not support Windows 10. Maybe a future update will make it compatible for the Windows 10. 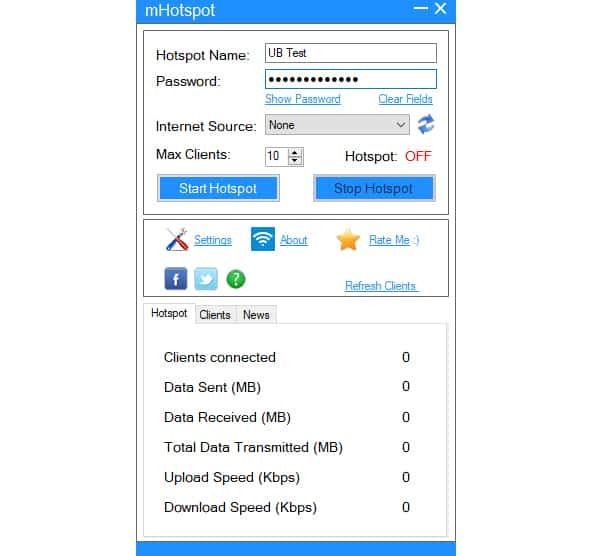 Now, mHotspot is another Wifi Hotspot Software for Windows, but unlike few it offers a full free experience. This software does not have any paid versions and is completely free to use. mHotspot lets the user share internet connection with either, Ethernet, cellular data or Wifi across various devices. The software is available for Windows 7, 8 and 10 and is the only free software to have this many features. With the mHotspot you have a limit of connecting 10 devices. Another great feature it offers is the ability to increase the Wifi range. It uses WPA2 PSK as for password security. 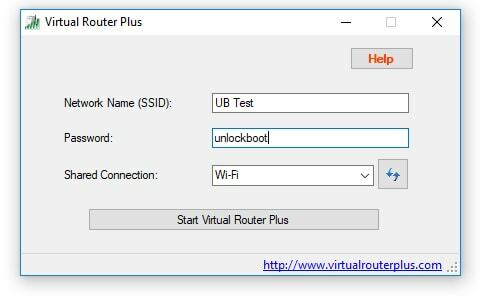 Now this is Hotspot software, unlike the other Wifi Hotspot software for Windows, Virtual Router Plus is free and open source. For developers the program is written in C# and is available for Windows 7 and 8. However, we have tested the program on our Windows 10 and it seems to work fine with it and we hadn’t had any problems or disconnections. You don’t need to install Virtual Router Plus just download it and play. The best part is that this program does not run any ads and will not track any web traffic. Like many it also uses WPA 2 for protection. 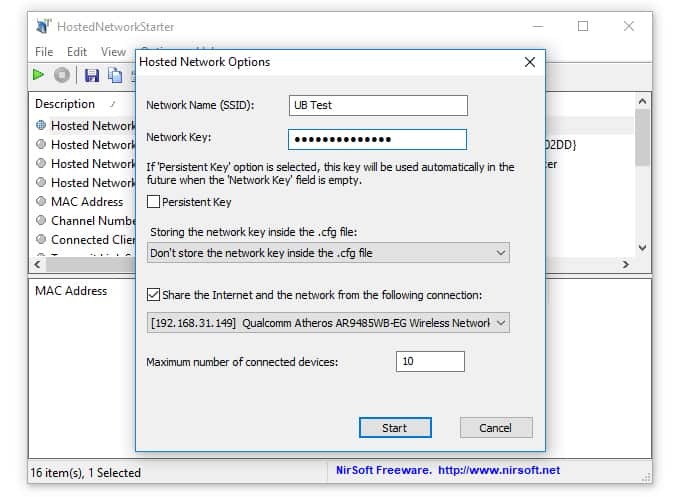 HostedNetworkStarter like the other Wifi Hotspot Software for Windows, mentioned in the list uses Wireless network to create a Hotspot. The software is compatible with the Windows 7, 8 and 10 but does not support XP and Vista. But how it is different from other Hotspot software mentioned here, is that you don’t need to install it. You can just download the zip file then unzip it and run the software. Let us know in the comments below any other Wifi Hotspot software for Windows we missed?